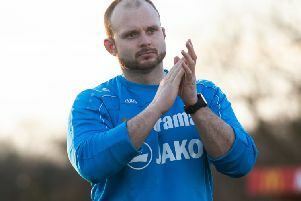 Hemel Town chairman Dave Boggins would seek another investor if Hemel Town were to achieve promotion to the National League this season – and the side will not be going full-time. The Tudors currently lie in the seventh and final playoff spot in the National League South with eight games to go and are very much in with a shout of going up . Hemel Town chairman Dave Boggins, centre, with Hemel MP Sir Mike Penning, left, and Kerry Underwood, pictured earlier this season. Speaking with the Gazette’s Hemel Town match-day reporter, Boggins said last week that he ultimately wants the club to stand on its own two feet and survive without his financial input. But the club is not in that position at the moment. Boggins said: “Where we are now and the league we are in we could not survive without my financial backing, but we are continuing to work towards that end. “If we were in the Ryman League and I dropped dead tomorrow we would be okay, but in this league and the costs of keeping us there we couldn’t survive. A 3G facility would certainly give us that security but even the reality of putting that in is that we would need to dig it up if we made it to the Football League, as may be the case with Sutton United. “If we get promoted to the next level then I would like to get another investor on board. “I would be looking at something like a 50/50 arrangement so that I could concentrate on the infrastructure of the ground [3G pitch, new stands etc] and the new investor could provide funds, mainly for players’ wages which would obviously increase. “I couldn’t do that on my own and to be honest, I’m not prepared to do that as it would be a massive financial burden. Asked if the club is ready to take the next step, Boggins said: “I believe we are ready although we will need to be more professional as a club, from the staff at the gate to the committee members and even the manager. “The main reason we asked Kerry Underwood and [Hemel MP] Sir Mike Penning to help us is because we want to make the club more professional. “When it comes to attracting sponsors, people will still see me as this ‘bullish’ Irish pub landlord. I don’t mean to be like this, but it’s the way I am, I was brought up in a city and I’ve run pubs all of my life and this is how I come across. “Kerry and Sir Mike will help us attract more sponsors and future investors. “As for the team, we would not go full-time. The sort of players we need would have to be able to continue with their own jobs, going full-time would not be an option to start with, it would be too costly for a club of our size. “Not all teams in the National League are full-time, so it can work well. “If we go up, we do not want the manager to just go out and sign players on high wages who may come in and only last a few games because they are not good enough at that level.